Who Does This Portable Mixer Appeal to? 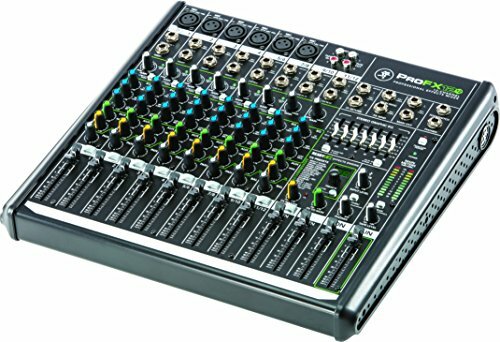 Conclusion Is The Mackie ProFX12V2 The Right Mixer For You? Having access to a good mixer is incredibly important for any musician. You need to be able to make sure that your sound is just right and you need a high-quality mixer to be able to do this. 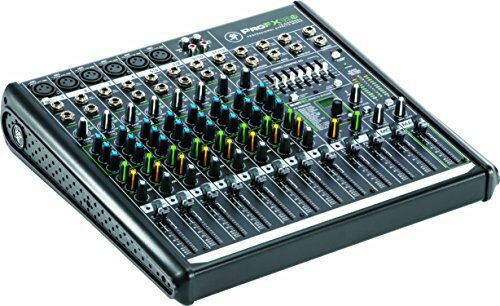 Even when you are playing smaller gigs or doing an acoustic performance by yourself, it makes sense to bring a mixer along. Sometimes it just is not going to be practical to carry a large mixer with you to every single gig, though. There are portable mixers on the market but most of them sacrifice quality for the sake of portability. This winds up somewhat defeating the purpose of using the mixer so you might be at a loss for what to do. Thankfully, there are some mixers on the market that are of very high quality while also being easily portable. 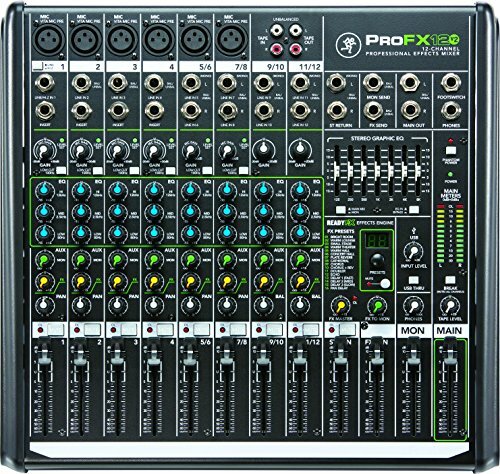 One such mixer is the Mackie PROFX12V2. This mixer is a very sought-after piece of equipment that will prove useful to many different types of people. It works excellently for musicians who play smaller gigs and could be useful to other professionals as well. Buying a mixer such as this is a big decision though so it makes sense to look at it from all of the different angles to see if it will fit your needs. Take the time to explore the Mackie PROFX12V2 in depth so that you can make the best purchasing decision possible. Right away, you can tell that this mixer is going to appeal to musicians who regularly play smaller gigs. If you are in a band or you are a solo act, then this might wind up working out great for you. This is a portable unit that is easy to haul to a show. It won’t ever feel cumbersome to carry this mixer around and it can offer you a very high-quality experience. The live mixing capabilities of this unit are very nice and will please true professionals. When you consider the low price of this product and the portability, it becomes clear that this is a great value. This mixer will work well for bands or solo artists who need to mix their sound levels to perfection. It offers you the ability to easily tinker with settings and the toolkit is robust enough to ensure that every instrument sounds professional. The overall quality of this mixer makes it something that could be useful to DJs as well. Being able to easily master the sound and mix things appropriately will be nice. Anyone who is hosting a karaoke night at a local establishment will be able to use this to produce the best possible results. It has the quality that live bands need and it is affordably priced enough to be practical for other types of professionals too. You will see that the effects that this mixer offers are very nice too. They are going to sound very smooth and professional every time. The effects engine is powerful and fully featured, which is impressive for such an affordable mixer. It makes it a very practical purchase for just about anyone who needs a portable mixer. Churches are common customers for this type of portable mixer as well. This could work very nicely for mixing the sound in a smaller or medium-sized church. The portability of the unit makes it a good fit for outreach programs where churches will have performances in an outdoor environment. This will work great for many different purposes so you will certainly get your money’s worth if you are looking at this for your church. You should not expect to get any extras inside of this package. You will be getting the Mackie PROFX12V2 unit that you ordered and that is it. This means that you may also need some microphone cables, guitar cords, stereo breakaway cables, or other odds and ends. Keep this in mind and order any extra cables that you will need for your setup ahead of time. The features of this unit are very impressive, especially when you consider the affordable price. The first thing that you need to note is that this is a 12-channel compact mixer. It offers you the versatility that you need for live performances while also ensuring your ease of use. This is a very easy mixer to get used to and it should not take long for you to be able to use it to its full potential. You will be getting six low-noise Mackie Vita microphone preamps when you purchase this mixer. This makes mixing vocals and getting the best possible sound easier than ever. The ReadyFX engine that is included is capable of providing you with professional-grade effects too. There are 16 different effects for you to enjoy including reverb, chorus, and delay. The quality of the effects will definitely please you and they can add depth to your live performances. The seven-band graphic equalizer is perfect for tuning mains and monitors. Plug in a set of quality headphones to the unit and you can fine-tune the sound to a high degree. It makes perfecting things for a gig simple. When you care about your sound, it will be useful to have this mixer to rely on. There is also an aux output for monitor mixes, venue 70-volt systems, and more. There are even inputs for your laptop or your MP3 player. This is fantastic for anyone who performs using backing tracks. 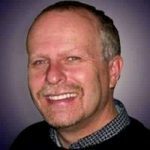 It will be easy to get things set up and you will always have a smooth experience. The three-band equalizer operates at 80 Hz, 2.5 kHz, and 12 kHz on all channels. You can also expect the 100 Hz low-cut filter to work brilliantly on all channels. This is a robust unit that will work great for your needs. If you need a portable mixer for gigging, then this is an easy recommendation. Those who are looking for an alternative should consider digging into the MX12 portable mixing console by Vangoa. This is a similar unit to the Mackie but it is not quite as fully featured. If you want the best quality, then you should go with the Mackie but this one will work pretty well too. It is portable and less expensive than the Mackie but you should not expect quite the same level of quality. It’s a good option that falls just short of the Mackie but it does allow you to save a small amount of money. Buying the Mackie PROFX12V2 will certainly prove to be beneficial. Anyone who is in need of a portable 12-channel mixer should give this unit a shot. It has the quality that you deserve while still being able to keep the price low. It’s a cost-effective mixer that manages to be professional-grade and portable at the same time. This will work great for bands that play small gigs, DJs, and even churches. If you want to buy a high-quality mixer, then this should be near the top of your list. It works nicely, it is easy to use, and setting it up is never a pain. The high-quality mixing toolkit is exceptional and the effects will certainly please you too.